I hope this post is particularly helpful for parents and teachers of elementary school children. Through my Twitter network last week I found via @Maths_Master‘s Great Maths Teaching Ideas ‘blog a 2010 post summarizing Dan Finkel’s Damult dice game. Recognizing that “practicing times tables can be unmotivated and boring for kids,” Damult is an attempt to make learning elementary multiplication facts more entertaining. I offer some game variations and strategies following a description of the game. Each player takes turns rolling 3 dice. First to break 200 (or 500, etc.) wins. On your turn, you get to choose two dice to add together, then you multiply the sum by the final die. That’s your score for that turn. Simple; no bells, no whistles. For example, I roll a 3, a 4, and a 6 on my turn. I could either do (3+4) times 6 for 42 points, OR (3+6) times 4 for 36 points, OR (4+6) times 3 for 30 points. I’ll take the 42 points. I spent some time playing this with kids the other day and I saw that (1) it was genuinely fun, and (2) it gives you almost all the multiplication practice you could ask for. In fact, it gives even more, because the choice of which dice to add and which to multiply reveals some interesting structure of numbers. 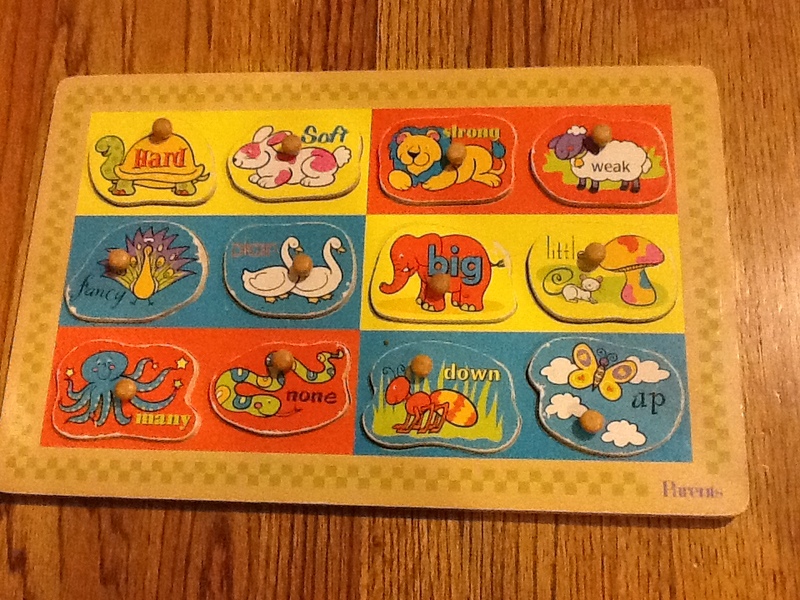 Seriously, get a kid hooked on this game, and it’s the equivalent of dozens or hundreds of times table practice sheets. It’s a fun activity idea by itself. Damult combines a bit of luck and memory, and rewards the ability to recall multiplication facts. 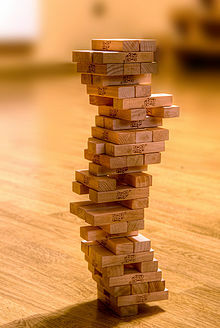 As an added bonus, it requires players to be able to manipulate objects in their heads–how many different ways can the three given dice be manipulated in summation stage to create unique products? How can a player ensure that she has found the biggest product for her score? Try the game! I love that the game completely randomizes the multiplication tables. This significantly enhances recall as memory is not tied to particular patterns or positions on fact pages. Players must adapt to each random roll. In any variation, there obviously should be a discussion among all players about what products were found to confirm the results. Make the game more formative or more competitive, depending on the experience level of the players. In more competitive variations with experienced learners, if a product was miscalculated and claimed, you might decide that no score should be recorded for that round. If you’re guiding someone on this it is critical that you DO NOT give answers. Students need to explore, hypothesize, discover errors, learn how to communicate their conclusions in clear and concise language, and to learn how to defend their findings while also learning how to admit flaws in their reasoning when faced with contradicting data. Experimenting and discovery is always deeper, richer,and more long-lasting than just being told. Remember the Chinese Proverb: “I hear and I forget. I see and I remember. I do and I understand.” Always seek understanding. The first comments on Dan’s post noted that while one player was summing and multiplying, the other player(s) were largely disengaged. Also, the game could drag on as unconfident players tried to make sure they had explored every possibility. To address that and several other possibilities, I offer the following Damult variations. Some more complex variations are toward the end. Read on! 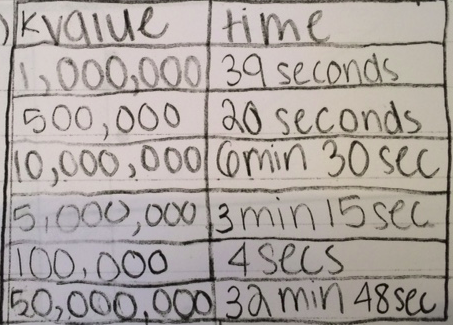 Finally, if you’ve read my ‘blog much, you know that I’m a huge fan of leveraging technology for math learning, but this is one of those situations where I think you should 100% unplug. To learn multiplication facts is to learn some of the basic grammar and vocabulary that makes the language of mathematics work. You simply can’t communicate mathematically with an underlying awareness of how the structure of the language works. Variation 2: Why must only one player be active? 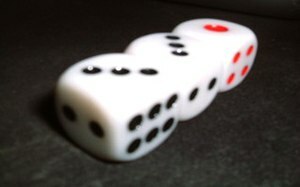 The players could take turns rolling the dice while both record scores based on what they find. If a particular combination was not noticed by one player, that player doesn’t get to consider it for his/her score. Variation 3 – As an aside, notice that Dan implicitly claims there are only 3 possible sums from a 3-dice roll. Will that always be the case? Can you convince someone why your solution is correct? Variation 4 – How many multiplication facts are possible using only 3 dice? This would be a great number sense exploration. Some may try it by gathering lots of data, others may have more sophisticated reasoning. I suggest that you or your students hypothesize an answer first along with some reason why you think your hypothesis is correct. Different answers are OK, and you can always revise your hypotheses if you get evidence leaning in another direction. No matter what, have fun exploring and learning. Variation 5 – After discovering or just using the answer to the last variation, you could use a table of multiplication facts and see how quickly different facts and be “discovered” from rolls of the dice. After rolling 3 dice, mark off all multiplication facts you can using the sum-then-multiply combination rules posed at the beginning. This might be a fun way for early learners to familiarize themselves with multiplication patterns. NOTE: If you play variations 4 or 5 as a game, you’ll likely want (or need) to stop before all possibilities are found. Some (eg, 6×12 and 1×2) will be pretty uncommon from dice rolls. Variation 6 – You could make a Bingo-like or a 4 or 5-in-a-row game. The first person to mark off a certain number of facts or the first to get a certain number in a row would be a winner. Variation 6 – If you try the last few variations, you’ll see that some products occur much more frequently from the dice rolls than others. This could be used to introduce probability. Which products are more likely and why? As an example, I suspect 3×7 could happen six times more often 1×2. 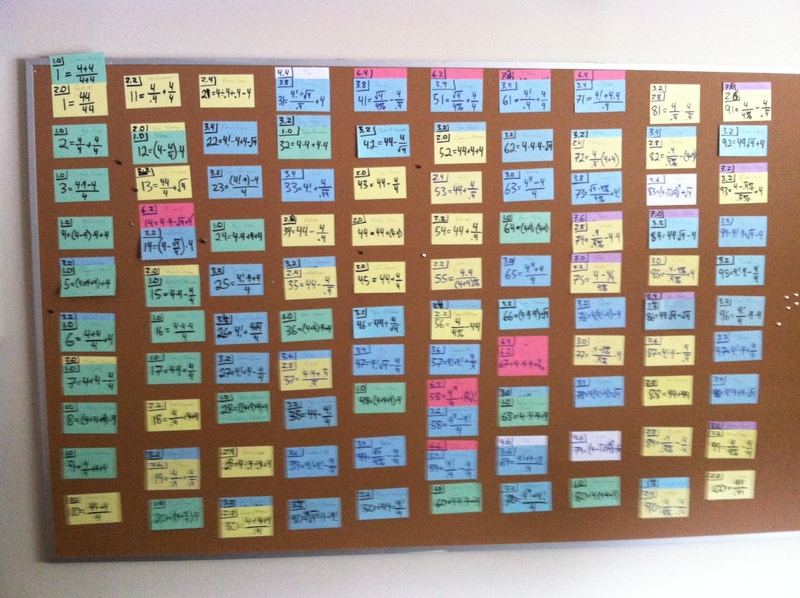 Can you convince yourself why 3×7 is so much more likely? 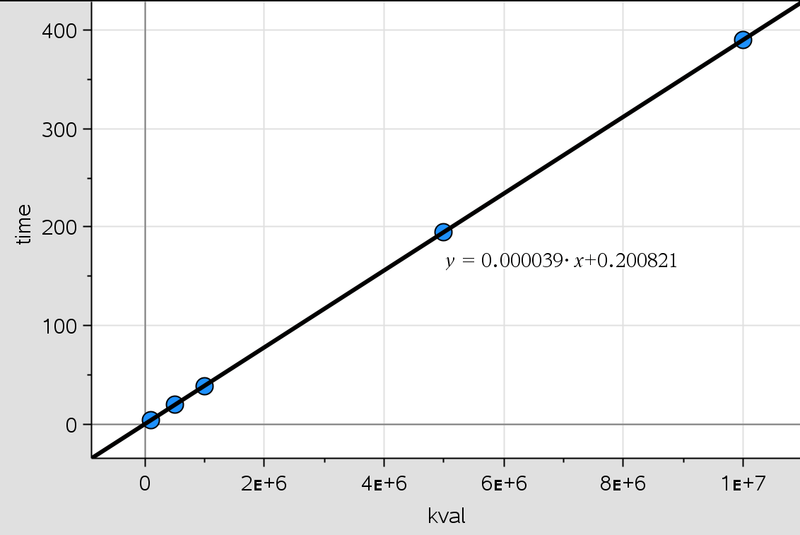 Can you see why 3×7 is exactly six times more likely than 1×2? Variation 7 – Why restrict yourself to 3 dice? When just starting out, using more than 3 dice would definitely be a frustration factor, but once you’ve got a good grip on the game, consider rolling 4 dice and allow players to multiply the sum of any 2 or 3 of the dice by the sum of the remaining dice. By my computation, using 4 dice means there are up to 7 possible combinations in a given roll. Can you prove that? Being able to consistently find them all is likely to be a very difficult challenge, but it is a phenomenal and early opportunity to stretch a young person’s mind into considering multiple outcomes and reliable ways to guarantee that you’ve considered all possibilities. Variation 8 – Why go for maximum products and being the first to get to 200 or 500 points? Why not try for a low score (like golf), seeking minimum products and being the last to exceed 100 or 200? Variation 9 – Stealthy Calculus: OK, my analysis on this one goes way deeper than is necessary to play the game, but sometimes knowing more than is necessary can give insights and can help you lead others toward developing “math sense”–a truly invaluable skill. LOW LEVEL – After you’ve played this a few times, ask the player(s) if there is some strategy that could be used to guarantee the biggest (or smallest) possible product for any roll. This could be a great mathematical experiment for which the solutions are not at all intuitive, I think. Some might figure it out quickly and others might need to gather lots of data, comparing products from lots of rolls before distilling the relationship. If you’re guiding someone on this it is critical that you DO NOT give the answer. Students need to explore, hypothesize, learn how to communicate their conclusions in clear and concise language, and to learn how to defend their findings while also learning how to admit flaws in their reasoning when faced with contradicting data. If you don’t know the answer, stop reading now and figure it out for yourself. I provide an answer in the next paragraphs, but experimenting and discovery is always deeper, richer,and more long-lasting than just being told. Remember the Chinese Proverb: “I hear and I forget. I see and I remember. I do and I understand.” Always seek understanding. In Dan’s initial example above in which 3, 4, and 6 were rolled, I stopped reading after the first sentence of paragraph 2 (pausing to think and draw your own conclusions is a great habit of the mind) for a few moments as I thought, “I know 3+4 and 6 are as close to equivalent as I can get, so 7*6=42 is the greatest possible product.” I didn’t even look at the other possibilities, I knew they were less. This fact was established (unnecessarily for me) in the end of the paragraph. Without calculus, I propose students try making tables of their data. They’ll have up to three unique products (Variation 3) and will need to explore the data before hopefully discovering the relationship. If a young person doesn’t discover the relationship, Don’t tell him/her! it is far better to leave a question as unanswered to think on and answer another day than to have a relationship given unearned. Value comes from effort and discovery. Don’t cheat young learners out of that experience or lesson. Conclusion: Don’t just play a game. Be creative! Strategize! Encourage young ones not just to play, but to play well. Children are quite creative in free play as they continually make new and adapt old “rules”. Why should intellectual play be any different? I’d love to see what variations others discover or have to offer. This will be the first of two ‘blog posts on an activity that could promote creativity for elementary, middle school, and high school students. A suggestion for parents and teachers is in the middle of this post. ABOUT A DECADE AGO, I first discovered what I call the Four 4s activity. In brief, the game says that using exactly four 4s (no more, no less, and no other digits) and any mathematical operation you want, you can create every integer from 1 to 100. Two quick simple examples are and . As for mathematical operations, anything goes! The basic +, -, *, / along with exponents, roots, decimals (4.4 or .4), concatenation (44), percentages, repeating decimals ( ), and many more are legal. At the time, I was teaching a 7th grade prealgebra course with several students who were struggling to master order of operations–that pesky, but critical mathematical grammar topic that bedevils some students through high school and beyond. I thought it would be a good way to motivate some of my students to 1) be creative, and 2) improve their order of operations abilities to find numbers others hadn’t found or to find unique approaches to some numbers. My students learned that even within the strict rules of mathematical grammar, there is lots of room for creativity. Sometimes (often? usually?) there are multiple ways of thinking about a problem, some clever and some blunt but effective. People deserve respect and congratulations for clever, simple, and elegant solutions. Seeing how others solve one problem (or number) can often grant insights into how to find other nearby solutions. Perhaps most importantly, they learned to a small degree how to deal with frustration and to not give up just because an answer didn’t immediately reveal itself. It took us a few weeks, but we eventually completed with great communal satisfaction our 1-100 integer list. I’ve created an easy page for you to record your solutions. A FEW WEEKS AGO, I read a recent post from the always great MathMunch about the IntegerMania site and its additional restriction on the activity–an exquisiteness scale. My interpretation of “exquisiteness” is that a ‘premium’ is awarded to solutions that express an integer in the simplest, cleanest way possible. Just like a simple, elegant explanation that gets to the heart of a problem is often considered “better”, the exquisiteness scale rewards simple, elegant formulations of integers over more complex forms. The scale also includes surcharges for functions which presume the presence of other numbers not required to be explicitly written in common notation (like the 1, 2, & 3 in 4!, the 0 in front of .4, and the infinite 4s in . In the past, I simply asked students to create solutions of any kind. I recorded their variations on a class Web site. Over the past three weeks, I renamed exquisiteness to “complexity” and re-ran Four 4s across all of my high school junior and senior classes, always accepting new formulations of numbers that hadn’t been found yet, and (paralleling Integermania’s example) allowed a maximum 3 submissions per student per week to prevent a few super-active students from dominating the board. Also following Integermania’s lead, I allowed any new submission to remain on the board for at least a week before it could be “sniped” by a “less complex” formulation. I used differently colored index cards to indicate the base level of each submission. Here are a few images of my students’ progress. I opted for the physical bulletin board to force the game and advancements visible. 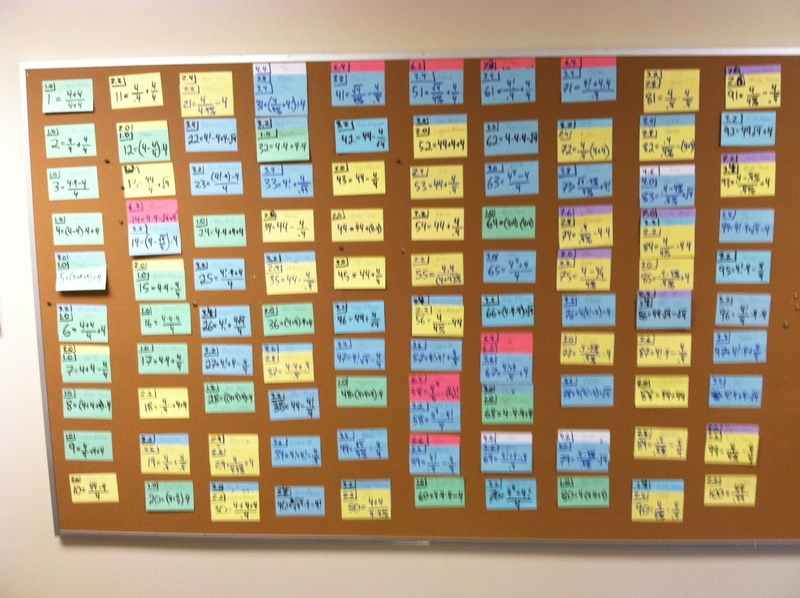 In the latter two images, you can see that, unlike Integermania, I layered later snipes of numbers so that the names of earlier submissions were still on the board, preserving the “first found” credit of the earliest formulations. The boxed number in the upper left of each card is the complexity rating. The creativity output was strong, with contributions even from some who weren’t in my classes–friends of students curious about what their friends were so animatedly discussing. Even my 3rd grade daughter offered some contributions, including a level 1.0 snipe, of a senior’s level 3.0 . The 4th grade son of a colleague added several other formulations. When obviously complicated solutions were posted early in a week, I heard several discussing ways to snipe in less complex solutions. Occasionally, students would find an integer using only three 4s and had to find ways to cleverly dispose of the extra digit. One of my sometimes struggling regular calculus students did this by adding 4′, the derivative of a constant. 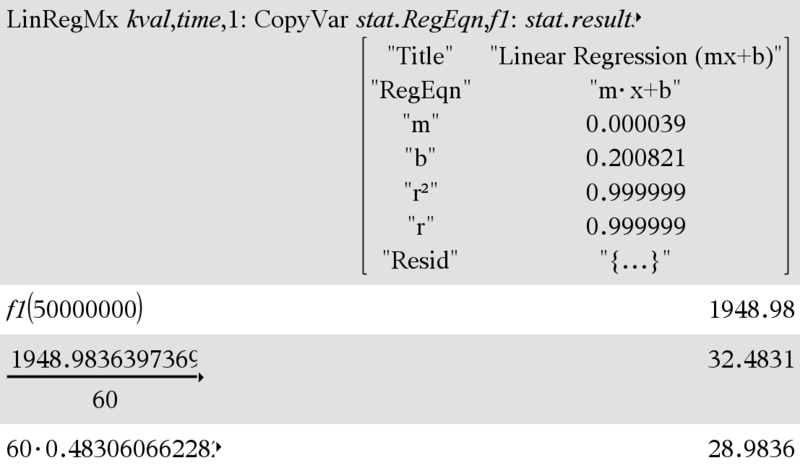 Another had already used a repeating decimal ( ), and realized she could just bury the extra 4 there ( ). 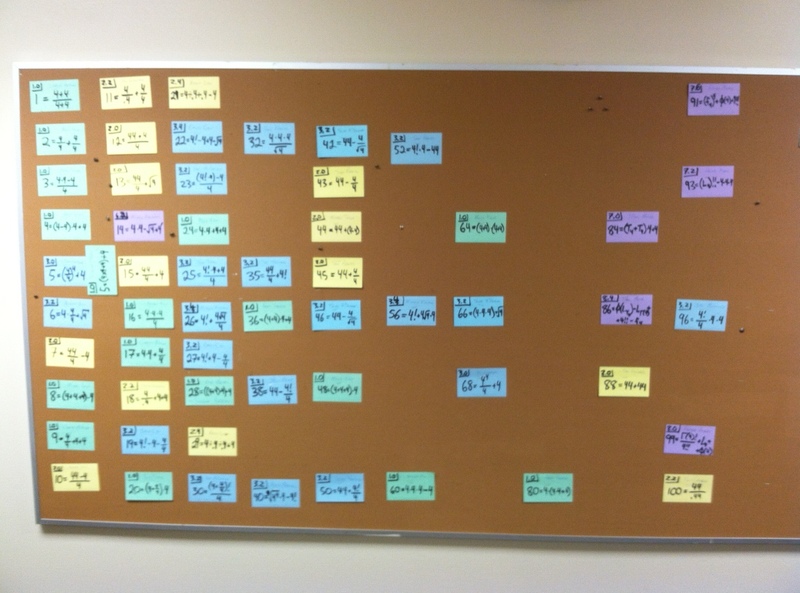 Two juniors dove into the complexity scale and learned more mathematics so they could deliberately create some of the most complicated solutions possible, even if just for a week before they were sniped. Their ventures are the topic of my next post. AFTERTHOUGHTS: When I next use Four 4s with elementary or middle school students, I’m not sure I’d want to use the complexity scale. I think getting lots of solutions visible and discussing the pros, cons, and insights of different approaches for those learning the grammar of mathematical operations would be far more valuable for that age. The addition of the complexity scale definitely changed the game for my high school students. Mine is a pretty academically competitive school, so most of the early energy went into finding snipes rather than new numbers. I also liked how this game drove several conversations about mathematical elegance. One conversation was particularly insightful. My colleague’s 4th grade son proposed and argued that from his perspective, it was simpler than the level 1.0 already on the board because his solution required two fewer operations. From the complexity scale established at the start of the activity, his solution was a level 2.0 because it used concatenated 4s, but his larger point is definitely hard to refute and taught me that the next time I use this activity, I should engage my students in defining the complexity levels. 1) IntegerMania’s collection has extended the Four 4s list from 1 to well past 2000. I wouldn’t have thought it possible to extend the streak so far, but the collection there shows a potential arrangement of Four 4s for every single integer from 1 to up to 1137 before breaking. Impressive. Click here to see the list, but don’t look quite yet if you want to explore for yourself. As a colleague noted, it would be cool for those involved in the contest to see how their potential solutions stacked up against those submitted from around the world. Can you create solutions to rival those already posted? 2) IntegerMania has several other ongoing and semi-retired competitions along the same lines including one using Four 1s, Four 9s, and another using Ramanujan’s ‘famous’ taxi cab number, 1729. I’ve convinced some of my students to make contributions. Play these yourself or with colleagues, students, and/or your children. Above all, have fun, be creative, and learn something new. It’s amazing what can be built from the simplest of assumptions. That, after all, is what mathematics is all about. The latter is a set of symbol manipulation rules that dominates most of what we teach in school. Mathematics, on the other hand, is a science of patterns. It is a way of logical thinking, making sense of forms and arrangements–sometimes applied and sometimes purely imagined. It involves looking at the implications of what we know and pushing that knowledge as far as we can to see what else can be learned based solely upon connections we can make from our assumptions. Within the last few weeks, I’ve discovered a great daily ‘blog run by @Five_Triangles “for (but not limited to) school years 6-8.” I’d argue that those posts are great for a broader range of ages. 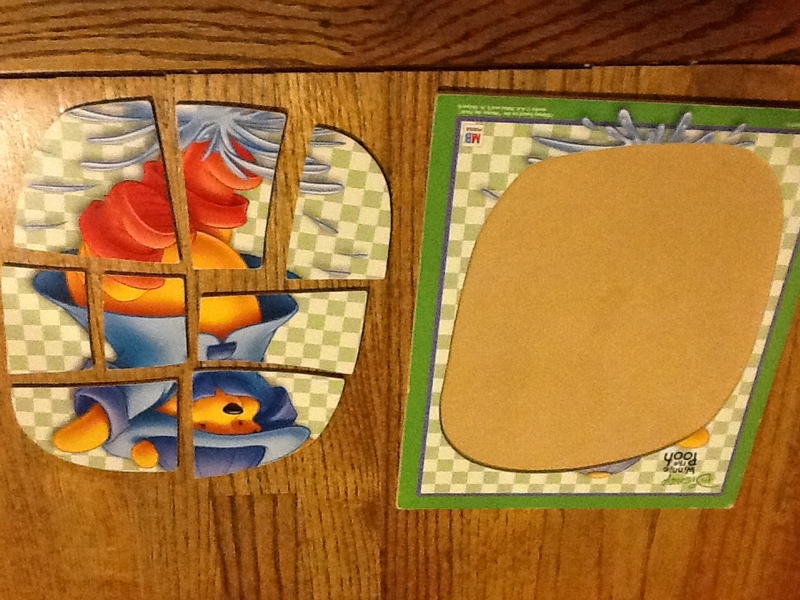 I gave my 3rd grade daughter one of the puzzles during breakfast. We had some great conversations then and on the way to school. I share those below. Another offering extends that thinking in a way that may not be immediately obvious to young people. Here’s the part of the post I used at breakfast. For my daughter, I saw this problem presenting two different possibilities–the obvious arithmetic problem and a mathematics extension. The arithmetic requires very basic subtraction facts and wee bit of trial-and-error (a GREAT mathematics skill!) to tease out a solution. Part of the mathematics here, in my opinion, involves asking a “What if?” question. I posed this problem to my 3rd grade daughter and after randomly dropping in some numbers at first and seeing some frustration, I said to her, “I wonder what sorts of numbers subtract to give 3.” Her frustration evaporated as she started making a list of several possibilities for such digits. She noted that there were far more possibilities for these difference than space in the problem allowed. I encouraged her to keep trying. We never explicitly discussed the problem’s set up with a four-digit number subtracted from a five-digit number, but I saw her try a couple different first digits before realizing that the first character of the five-digit number clearly had to be “1”. A little more experimentation and she had an answer. She thought the puzzle was over–after all, school has trained her to think that once she had “an” answer, she must have found “the” answer. That’s when I prompted some mathematics. I asked if she could find another answer. A few other prompts and she had found 6 different solutions. I asked her how she found them. “Easy,” she replied. “You just put the number pairs in different orders.” She found through trial-and-error that the five-digit number always started “12…” and therefore the four-digit number started “9…”. Checking her list of differences leading to 3 left no other possibilities. Everything else was flexible, thus her six different answers. Can you explain why the five-digit number must start “12…”? Once I had the “12…” and “9…”, I knew there were at least 6 solutions before I had found even the first one. My daughter wasn’t ready for this thought, but can you explain why this is true? Can you find all 6 answers? Better: Can you explain why there cannot be any more? The second part of the problem (with the same rules and a different result) is definitely tougher. You can quickly conclude that the first digit of the five-digit number must be 4 or 3, but it’s definitely more challenging to tease out the rest. Rather than dealing with the entire problem at once, I suggest another great mathematics strategy: Simplify the problem. 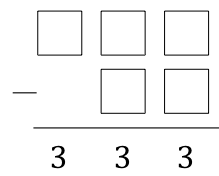 Using only the digits 1 to 9, can you find all possibilities that would result in the beginning of the problem? 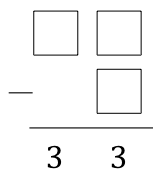 If this is part of an answer, the six digits not used in those three boxes must have an arrangement that subtracts to 333. Unfortunately, none of these actually pan out. Convince yourself why this must be true. Students need to learn that not finding an answer is OK. Knowing that there’s not a solution is actually a solution–you’ve learned something. eventually shows that the five-digit number could start “412..” with the four-digit number starting “79..”. That means the remaining four digits must have exactly two arrangements for precisely the same reasons that the first problem had six solutions. Can you find the two arrangements that satisfy the 33333 problem? In case you want to check, I list the answers at the end of this post. The next week provided another puzzle using the arrangements idea. The problem doesn’t yield a straightforward solution that can be solved. Instead, laying out all possible finishing arrangements and testing the veracity of the claims leads to a solution. Again, there are three entries, so this problem is (mathematically) just like the 3333 subtraction problem above–both have six possible arrangements. Helping a young person see this connection would be a great thought achievement. 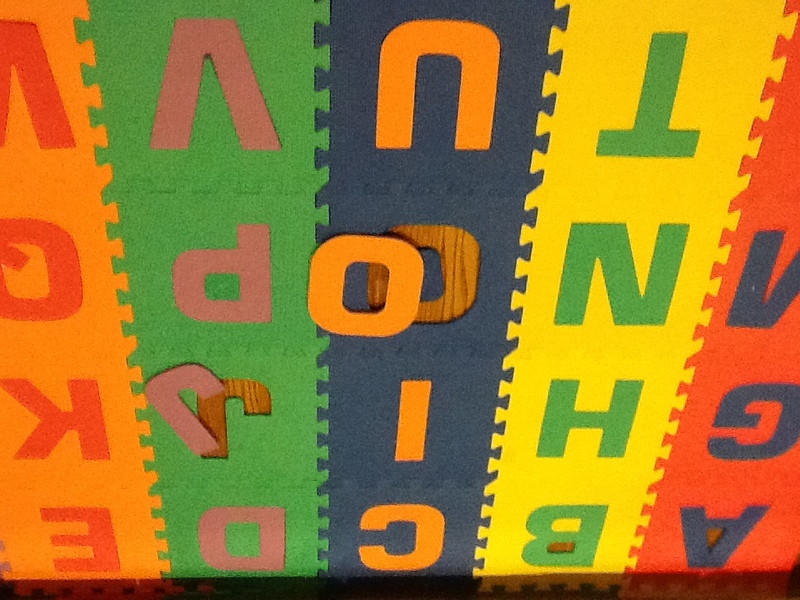 Start by listing the six possible 1st, 2nd, and 3rd place arrangements of the letters A, B, and C: A-B-C, A-C-B, B-A-C, B-C-A, C-A-B, & C-B-A. As an example, if the boys finished A-B-C, all three boys would have told the truth, so that finish doesn’t satisfy the problem requirement of one false statement. Comparing each arrangement to the boys’ statements eventually shows that only one of these arrangements satisfies the problem’s requirement that exactly one of the three boys made a false statement. A good mathematical extension would be to see if there are any other questions that could be asked from the boys’ statements. Is it possible that all three told the truth? Is it possible that only one was truthful? Are there any other possible outcomes? Do any of these have unique outcomes given the boys’ statements, or do some have multiple possibilities? CONCLUSION: I fear that too often school and students stop at a single answer and don’t explore other possibilities. Asking “What if” is a critical question in all of science and mathematics. It inspires creativity, wonder, and exploration. It doesn’t always yield results, so it also helps motivate stamina. Convincing yourself that there are no (more) solutions is itself an intellectual accomplishment. 3333 solutions: 12678-9345, 12687-9354, 12768-9435, 12786-9453, 12867-9534, & 12876-9543. 33333 solutions: 41268-7935 & 41286-7953. Any students who understand nothing more two-digit addition could enjoy the magic that comes from getting the same answer every time. Older students who are beginning to understand something about variables can handle the generalized question Ben asks. Depending how one approaches the proof, a student might discover that this problem generalizes even a bit further than Ben suggests in his initial post. Don’t read any further if you want to solve this problem on your own. Following the rules of selecting a number and then crossing out any other entries in that numbers row and column, every sum of four numbers selected this way will contain exactly one element from every row and every column making the overall sum contain an (a) from column 1, an (a + 1) from column 2, an (a + 2) from column 3, and an (a + 3) from column 4. Also, every set of four numbers will have outside the parentheses nothing from row 1, a “+4” from row 2, a “+8” from row 3, and a “+12” from row 4. That means the numbers you add for this sum will be some arrangement of . Because for the given problem, the magic sum for this problem is 34. That solves an arithmetic problem. EXTENSION 1: Now think a bit more mathematically. Notice that all my proof requires is that the upper left number be (a). That means any consecutive integer run starting at any integer a in the upper left corner of a 4×4 grid would produce a constant sum of . Encourage your mathematical explorers to start with or include all types of integers, including zero; include negative numbers if they’re ready for that. 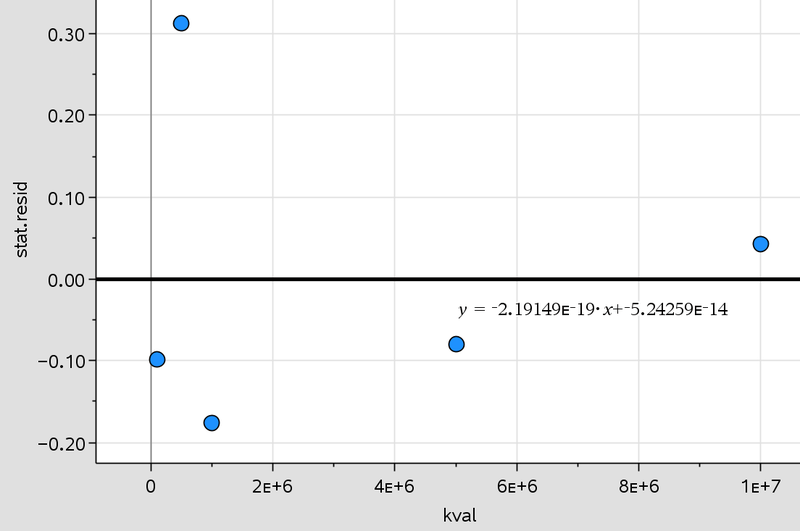 EXTENSION 2: How many different ways are there to pick numbers from a 4×4 grid in this manner, no matter what value (a) you place in the upper left corner? EXTENSION 3: Pushing just a little further, can you prove why any square grid of any size filled with any consecutive elements of any arithmetic sequence produces a constant sum?